I just returned from a week in Marrakech where I, along with 700 leading travel industry buyers and sellers, attended the first annual, invitation-only PURE Life Experiences global travel trade show. This wasn't just any travel trade show. Over a course of five days, I had the chance to meet & mingle--in Morocco!--with the owners & operators of some of the coolest travel companies in the world. One of my favorite new companies is AquaExpeditions , a two-year-old Peru-based soft-adventure specialist run by CEO/owner Francesco Galli Zugaro. 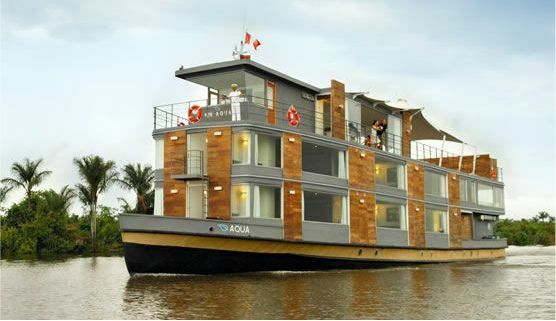 Set to debut a sister ship to its 24-passenger, 130-foot custom-built MV Aqua next year, Aqua Expeditions allows guests to enjoy the most unspoiled reaches of the Peruvian Amazon--in comfort--for three, four or seven nights. According to National Geographic Traveler Editor Keith Bellows: "If you want to see the real Amazon, the Aqua is the way to do it." All-inclusive rates run from $2,250 (3 nights) to $5,250 (7 nights) per person. If you do prefer a Peruvian land adventure, consider the 7-day/6-night Machu Picchu lodge-to-lodge run by Mountain Lodges of Peru. Priced from $2,010/person, this guided small group trip (no more than 12 people) includes 4 to 6 hours of guided walking per day, all meals and comfortable accommodations in four small lodges along the Inca Trail. I highly recommend extending your stay at the Sumaq Machu Picchu Hotel, a 60-room luxury boutique hotel at the base of Machu Picchu town (20 minutes from the archaeological site). This chic two-year-old property features an outdoor restaurant w/stunning views, locally designed, Andean-style furnishings, a spa, yoga, cooking lessons & gourmet cuisine prepared by one of Peru's top chefs. For a true respite, a week at one of the wellness retreats I discovered at PURE may be in order. Take your pick: Valencia, Spain or the Kenyan coast? In Spain (just outside Valencia), the Sha Wellness Clinic is a former country house-turned-wellness clinic. Built on the principals of prevention and well-being, Sha is "macrobiotics for modern times," according to its owners, who tell me: "You come here to change your life". The stylish accommodations and setting are just the backdrop for the true purpose of a week's stay at Sha, which include a personalized treatments/stress management program, macriobiotic meals, spa treatments, yoga & accommodations in a seaview suite. I promised Sabina, the Italian-born, Kenya-based manager of Lion in the Sun Retreat, I will absolutely come visit her next year and I intend to live up to my word. Formerly a private house, this charming property owned by Italian doctor Henri Chenot is definitely where to head when detox + R&R are in order. Set across from a stunning private beach, the Kenyan retreat offers tailor-made wellness programs featuring a mix of Chinese & Western medicine, hydrotherapy, spa treatments, accommodations and delicious healthy meals. Who wants to join me on a Kenyan wellness retreat in 2010? For more information on any of the companies mentioned, feel free to email elitetravelgal@gmail.com or visit www.elitetravelinternational.com. Look for additional EliteTravelGal posts this week highlighting other cool discoveries from PURE Life!